On the third day of a three-day Shambala meditation training in Boston, I discovered that I couldn’t meditate. This was five years before I became an Orthodox Jew (I was Jewish biologically then, but secular). I was twenty-four, and hitting the job market after college had proven to be sordid – I had no idea what I wanted to do for work, so I took anything I could get, which meant a series of increasingly bizarre jobs that started with assisting a very grouchy technical writer and our psychopathic narcissistic boss, who was the boastfully-proud leader of his Sons of Italy chapter, smoked cigars, and dyed his mustache shoe-polish black. It culminated in a full-time gig as a housekeeper for a very rich dysfunctional family for whom I ironed underpants. Who likes wearing stiff underpants? They did. The Shambala meditation training seemed like a panacea to me. I was rocking an “artistic temperament” at the time, and it wasn’t working for me. I thought that with three solid days of meditation, I’d walk out a new woman – as non-reactive as chalk. I cannot adequately emphasize how delusional that fantasy was. Everyone in the seminar seemed to be doing fine. They sat still on their mats, and during the debriefing sessions they shared thoughtful accounts of feeling peaceful. As far as I could tell, they were just perfecting their covetable tranquility. Such was not the case for me. The third day was the long and arduous meditation day. We were instructed to label our thoughts as “thinking” and then magically envision them evaporating into the ether. I tried, but I had so many thoughts that I felt like I was shooting missiles out of the sky. Bang, bang, bang – they kept coming at me and all I could do was fire a mental rifle at them and imagine them hitting earth with a dust-raising thud. I shared my experience of “letting thoughts go” at the debriefing session. Everyone stared at me like a Mutant Ninja Turtle had infiltrated their sanctum of perfectness. The meditation teacher shook his head with what looked like genuine mournfulness. “No,” he said. “That’s not it.” It was the head shake of giving up, and I knew it. Which didn’t stop me from then trying Insight meditation, Zen meditation, walking meditation, hypnosis, self-hypnosis, and eventually trying to meditate on the Oneness of G-d. Of all of them, Zen meditation was the most successful because the teacher talked a lot. I didn’t have time to think because I was busy trying to follow the rapid-fire guided images coming out of his mouth. Here I am, following a light into a tree. My feet are itchy. No! Go back to the tree! Now we’re in the roots of the tree. Keep going into the purple light! Wait, it’s pink now. And it’s a bubble. Nobody can hide in a bubble like you can, Chaya! When five years later I found myself in seminary in Jerusalem, I was a bit miffed to discover that in Judaism there is a high premium placed on contemplating the Oneness of G-d. Chassidus class (Jewish mysticism, or Kabbalah as condensed and taught by the Chassidic master scholars) was my nemesis. On the first day of class, the rabbi who taught the class informed us that we were learning Chassidus at the crack of dawn in order to instill a mystical love and awe of G-d in us before saying our morning prayers. Prayers, he said, didn’t have the same impact if you didn’t approach them having meditated on the Oneness of G-d. I spent the first five months of seminary sleeping through Chassidus class because every time I went in there I felt doomed. For instance: Did you know that the mystical tradition teaches that when you are doing a mitzvah, you are connected to G-d by a spiritual chain? Action, not just contemplation, counts in Jewish spirituality. Which brings up an important question: What is spirituality? Is it something you experience within yourself, or is it something that unites you with the world (not in a gross way)? Is a certain level of communion with the higher worlds the hallmark of having a spiritual life, or is acting like a mensch here on Earth the true jam? In truth, it’s both, but the latter will lead you to the former. The way that action works in Judaism is that it is immediately accessible to anyone, regardless of “spiritual level”. Learning that was a breakthrough for me. It started with a class in seminary on applying Chassidus to everyday life. The lady who taught the class didn’t discuss the upper worlds or the Oneness of G-d. She got down to the basics, and her message was: give tzedakah (charity). Put a coin in a charity box every day. Give someone a dollar on the street every day. Pay your 10% post-tax-income ma’aser – the modern-day application of the tithes in the Holy Temple. You can choose whatever charity you want to give your ma’aser yourself. 20% if you want to be extra. For a while I was working a 60-hour-per-week tech startup gig. I had no time to think about much in the upper worlds and there were times that I struggled with other religious issues. Sometimes I felt like, “I am a screw-up of a religious Jew, but I can do this one thing: I can give 20%.” So I gave 20%. I was going to a daily early-morning Chassidus class before work, but it resonated with me in a very slight way. Not much got in – I just knew I had to do it. There was something I liked about it, but I didn’t – in any way – get it. But work and pay I could do, so I did it. And you know what? It was a spiritual anchor. Another example of action: Keeping kosher. Is it glamorous? Does it make me feel like I am transcending the material world? No, but it is part of having a spiritual life for me. 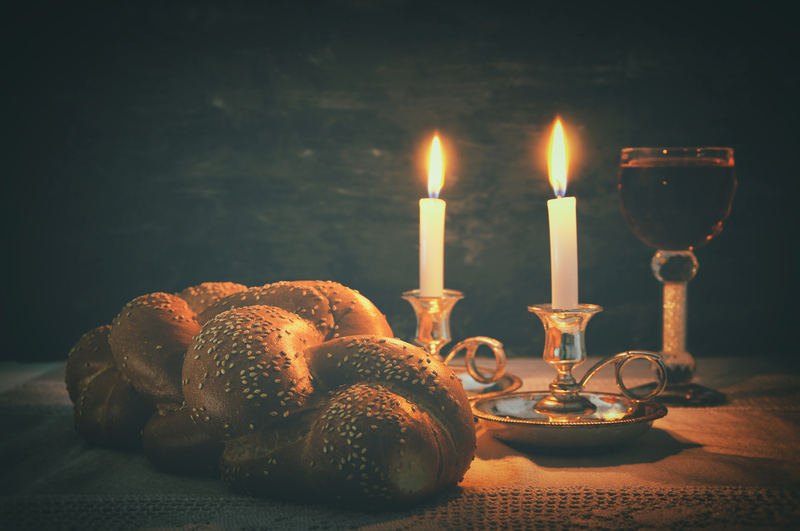 G-d said, “Do it,” so I do it, and by doing it I connect to G-d, and I help my family to connect to G-d because they are eating kosher food. My son has never tasted non-kosher food, and according to the sages and the mystics that is very good for his soul. He was nourished in-utero by kosher food. What his body is built from is kosher materials, which means he is physically built from mitzvahs. No contemplation there, but the action totally did the job. But wait, there’s more: Lighting Shabbat candles is something I do, not something I meditate on. There are benefits to lighting with great intention and concentration and following lighting with a period of meditation. I don’t do that. I light, and then I pray, and I call it a night. But the action itself adds light to the world – spiritual light – without me having to make an effort to “be spiritual”. Mitzvoth are a G-d-send for those of us who move faster than we think, or are simply too anxious to meditate. They also frequently offer the benefit of directly benefiting other people, which I think helps the world a lot more than when I was shooting thoughts out of the sky while sitting on a mat feeling like a loser. Chaya Kurtz is an essayist based in Brooklyn, NY. She blogs on Hevria, and for the Meaningful Life Center. Her work has been published in the Sourcebooks anthology "Jewish Daughter Diaries: True Stories of Being Loved Too Much by Our Moms". Can Wintertime SAD Enhance Creativity?